AIATSIS Bibliography - Adnyamathanha language and people. Flinders Ranges Aboriginal songs, 1939. McEntee, John and McKenzie, Pearl. Adnamatna English dictionary, 1992. McEntee, John. Pronunciation guide to the Adnamatana language, 1976. Neville, Lily. Adnyamathanha Ngawarla, 2007. Shebeck, B., Hercus, LA and White, IM. Papers in Australian linguistics. no. 6, 1973. Tunstill, Guy (ed). Adnyamathanha years R to 10 : a teaching framework for revival and second language learning in years reception to ten, 2004. Adnyamathanha yarta nakuntha [videorecording] : to look at the Adnyamathanha land, 1992. The Lives of Jim Page and Rebecca Forbes in the Adnymathanha Aboriginal Community, Interviewer: Tracy Spencer, 2001-2002. This guide to sources relating to the Adnyamathanha people was last updated in 2016. It comprises selected material held by the State Library or available online. See also the Library Guide on the Nepabunna Mission. For more assistance, talk with staff at the Library's Information Desk or Ask Us. The Aboriginal people of the Northern Flinders Ranges at the time of European settlement were the Wailpi, Guyani, Jadliaura and Pilatapa. These four language groups are now collectively referred to as the Adnyamathanha, although some descendants of these groups identify with and maintain their original affiliations. Nepabunna was established by the United Aborigines Mission in 1931 on land donated by Balcoona Station owner Roy Thomas. It was the first permanent home the Adnyamathanha people had known since their displacement from their traditional lands in the early 1850s. After years of Mission and Government control, Nepabunna was handed back to the Adnyamathanha in 1977. In 2009 the Federal Court recognised that the Adnyamathanha hold Native Title over much of the Ranges, including Nepabunna and vicinities. The Adnyamathanha people : Aboriginal people of the Flinders Ranges : an Aboriginal studies course for secondary students, c1992. Bonney, Neville. Adnyamathanha and beyond : useful plants of an ancient land, 2007. Brock, Peggy. 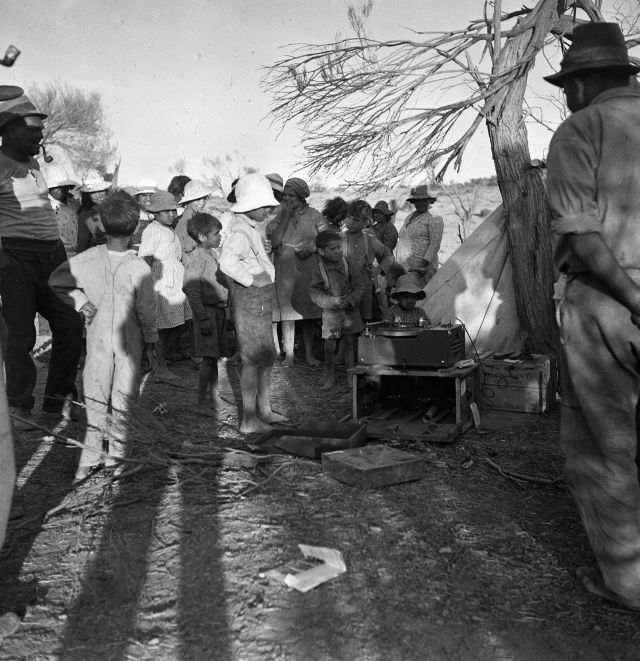 Outback ghettos : Aborigines, institutionalisation and survival, 1993. Brock, Peggy. Yura and Udnyu : a history of the Adnyamathanha of the North Flinders Ranges, 1985. Davis, Christine. Adnyamathanha genealogy, 1985. Ellis, Julie & Bob. Nepabunna: a brief history, 2011. Explore the Flinders Ranges, 2014. The Flinders Ranges : an Aboriginal view, 1986. Lamshed, Max. 'Monty': the biography of C.P. Mountford, 1972. Ch. 10. Mountford, Charles P. Women of the Adnjamatana tribe of the Northern Flinders Ranges, South Australia, 1941. Ross, Betty. Minerawuta : Ram Paddock Gate : an historic Adnyamathanha settlement in the Flinders Ranges, South Australia, 1989. Tunbridge, Dorothy. Flinders Ranges dreaming, 1988. Tunbridge, Dorothy. Artefacts of the Flinders Ranges : an illustrated dictionary of artefacts used by the Adnyamathanha, c1985. Wrightson, Karolyn Kosanke. The fire that brought peace : a spiritual trek at Gum Creek, 1997. The Library holds many photographs relating to this topic, which can be viewed online by searching the Library catalogue. This record group comprises a unique collection of material amassed by C. P. Mountford during a career spanning the 1930s to the 1960s and includes material relating to the Adnyamathanha people. Arrange access to the collection by prior arrangement. To locate journal articles, access the State Library's eResources. Selected South Australian newspapers, published prior to 1955, have been digitised as part of the National Library of Australia’s Trove website. Further newspaper articles may be indentified by using the following, Newspaper index : references to Aborigines in Adelaide newspapers, 1836-1940, 1989.